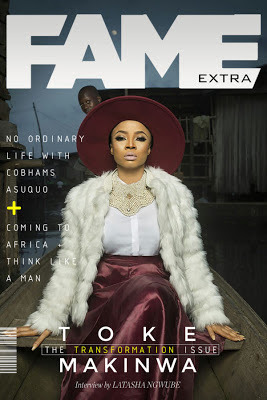 Popular Nigerian media personality, Toke Makinwa is on the cover of the first edition of Fame Extra Magazine and in this new feature, she opened up about dating again and the journey so far. Enjoy! Misconceptions about marriage; People are not honest enough! You are told to keep quiet about everything like showing a sign of ‘all is not well’ automatically means you have a bad marriage. The thing is, everyone struggles, no situation is perfect and if people walked around with a little bit of honesty about their situation, a lot of marriages might survive. Religion is also a very big problem, God is involved in Marriage and he has also blessed us with the capacity to think and make decisions for ourselves so people need to be less religious and more aware of His love. There will be way less judgement. So much goes on in a home and you are told to keep mute, keep taking, pray till your knees get dark from kneeling (which is a good thing, don’t get me wrong), but a lot of people lose who they are trying to keep with all of these mandates that doesn’t always work. I am not saying you should go around telling everyone your business but I feel if we had more people open up about their struggles and a society that is less judgmental, people will begin to appreciate the beauty of seeing two people work at staying together and realising the sheer amount of work required on both sides. Dating again: Yes, and I am having a lot of fun right now. On being single: It’s tricky! It’s exactly like learning to ride a bike again but I think I am doing very well. Laughs. Of course you get the initial stumble and fall off but the key is to accept that things are different now and that’s ok. My first date after my separation, I cried on my way home as I couldn’t believe I was back dating again, the stress and joys of getting to know someone again, the excruciating pain of the past and the will to trust another again. The most absurd thing she has read: That I had a child I was hiding. It was so silly but yeah, that was funny. Handling controversies: I just don’t meddle too much in what is being said or how it is being analysed… I simply keep it moving. God has been so incredible in my career and before I started, he told me. “You will hold your peace and I will fight for you”. He has not failed me yet. I just pray about the situation and remind him always that as a servant looks up to his master and a maid servant to her mistress; my eyes are on him (GOD). 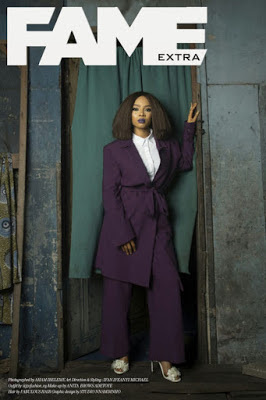 Speaking on plastic surgery: Hmm… I am not against it, I feel like it’s a comfort thing, I have seen people struggle with those things that they are insecure about and once they get something done, they become different people. They are more confident, and if it rocks their boats, why not? I never judge another’s decision as I haven’t walked a quarter of a mile in their shoes so whatever makes you happy, whatever helps you sleep well at night…. Knock yourself out.